It has been brought to my attention that some of my guy friends would be interested in some quick, simple recipes. Who am I kidding? We all want quick, simple recipes. Therefore, I am introducing recipes for the "one pan man", or OPM for short. Whenever you see this in the title you know it is especially easy and requires minimal effort, still resulting in fabulous results. If you would like to be notified of the OPM recipes only please shoot me an email at: Emily@justeatfood.com with "opm" in the subject line. I would be happy to let you know when there is a new recipe to check out. Don't worry, my husband (not me) is the one that is ensuring that these are indeed one pan man easy. 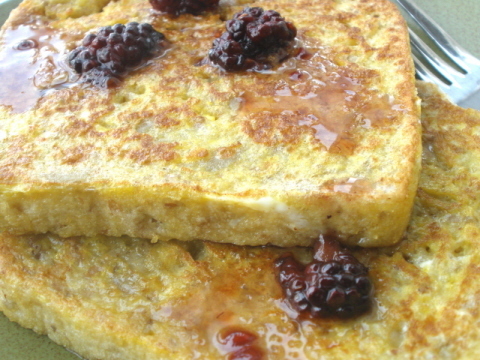 French toast is one of the quickest breakfasts, and always looks so great. This is a sure fire way to impress your girl. So gentlemen...fire up that skillet! You don't have any excuses now! Ok, so this is a 2 pan recipe. Close enough. It is still pretty simple. In a small saucepan over low heat add syrup and berries. These should be hot by the time the toast is all done. In a 9-in. pie pan (or just use a bowl) whisk the eggs and milk together. Sprinkle a light layer of cinnamon across the egg mixture. Do NOT go too heavy on the cinnamon. Set the egg mixture aside until the skillet is hot. Heat a large skillet over medium heat. Once it is hot add ½ tsp. butter to each spot that a slice of bread will fit. While the butter is melting, take a slice of bread, lay it down in the egg mixture, then flip to coat the other side. Then place in the hot skillet and repeat until the skillet is full. Once the toast is golden brown on one side flip it to cook the other side. Repeat this process until all toast is cooked. Serve toast with syrup, and powder sugar if you have it. Then sit back, relax, and wait for the praise.